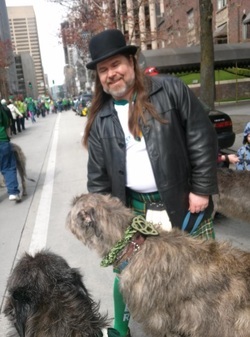 Since 1970, the Irish Wolfhound Club of Puget Sound has been dedicated to the protection, preservation and love of the Irish Wolfhound. Our club is small in number but large in enthusiasm and dedication. We typically have four meetings/social gatherings per year rotating around the Seattle and surrounding areas. At these meetings, we not only tend to club business, but offer our members educational opportunities to advance their understanding of the Irish Wolfhound and to nurture friendships and camaraderie within the group. Some educational topics have included the proper grooming and presentation of the Irish Wolfhound, Obedience, Tracking, discussion of the breed standard and more. We have an annual AKC "b" match to get our hounds ready for the upcoming show season as well as a Regional Specialty Show every August in Auburn Wa. In true Irish spirit, IWCPS enjoys taking part in the annual Seattle St. Patrick Day Parade in downtown Seattle every year. There is something for everyone! 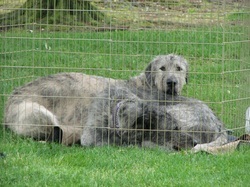 Our club is for anyone who loves the Irish Wolfhound! You don't need to show your hound or even own an Irish Wolfhound. The only requirement is the clear desire to promote and protect the breed. To learn. To make friends. To love the Irish Wolfhound. Parade! 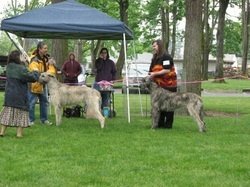 Rain or Shine the Hounds Represent the Irish Wolfhound Club of Puget Sound!